As the flowers begin to pop up, it seems every spring many new restaurants do the same. It’s been impossible to keep up with the flurry of activity around town this year – and in the world of our own restaurant reviews, we prefer to visit each new spot at least twice before giving any Final Answers about who is doing things well (or who isn’t). This week on Wicked Local we bring to you just a quick synopsis of the Cambridge/Somerville springtime “new releases” you may want to put on your “must checkout” list. Check it out! Have you popped in to anyone of these new spots yet? What was your impression? I perused the world wide web this week to see if I could find any good juice to whet your whistle in anticipation of the Super Bowl on Sunday, in the way of wine, anyway. For me it is a" holiday" wholly dedicated to enjoying absolutely delicious beers, as you gear up for whatever main meal you may be dishing up (for me it will be homemade pizza, with roast chicken, fresh basil, mozzarella and pineapple). Maybe I'll open a bottle of some exceptional vino to pair with my dinner, but more likely I'll be digging into the Ommegang Abbey Ale - a wine lovers beer, in my humble opinion, because it offers such an intriguing, inviting nose, a round texture and layer upon layer of flavor. What I found instead was some intriguing news about the world famous Ferran Adria, of Spain's El Bulli. He's taking a little break - and the "reason" up for grabs, according to the press. Last but not least, I was happy to read Dr. Vino's article on the up-and-coming Blaufrankish varietal (aka Lemberger). Check out his musings here. Which beverage will be in hand for you this Sunday? Got Graham? 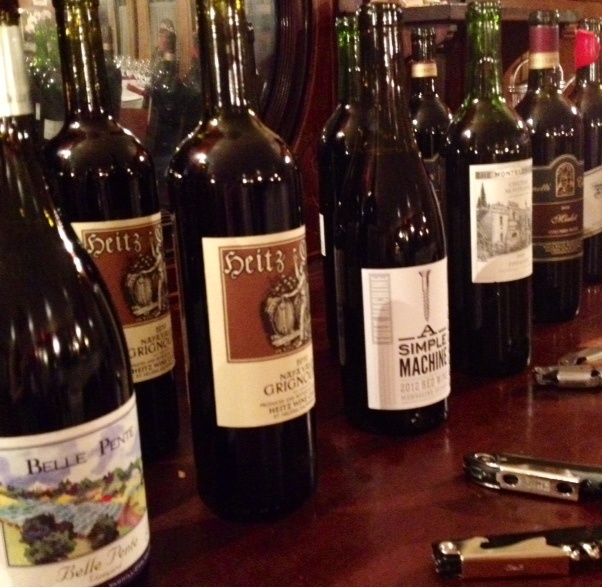 Or have you at least tasted one (or more) of the Bonny Doon wines? What did you think? My experience tells me most winemakers are a bit bizarre - the level and specific style of bizarreness being unique to each, of course. But I do think there is something super special about the California bread of crazy winemaker. Yeah, they are brilliant; but they push The Envelope more knowingly or deliberately somehow (whereas folks from Washington or Oregon, Spain, France and the like operate as they are, just bizarre creatures making wine). Joe Roberts, aka 1WineDude, reviewed Randall Graham's new book Been Doon So Long and also chatted with the winemaker this week about it. Pretty freaking funny. Entertain yourself reading Robert's blog post over lunch. Then grab a copy and report back with your opinion of it. By way of news this week, my old favorite Gourmet magazine is going under! I couldn't believe the headline. I mean, yeah, wine has been less a focus for sometime, but the photos are gorgeous, the journalism interesting, and the recipes worth investigating. Plus, it is an institution! Read more at Decanter. Are you upset? Or have you found another pub to entertain you? Last but not least, for those in the Boston area you can support a good cause while enjoying some vino. On Oct 15 hang out on the rooftop at the Taj, taste some wine and support the Visiting Nurse Association of Boston. Click here for tickets and more information.